Click, slide, flip, breathe, roll and spin with this innovative stress-relief gadget! 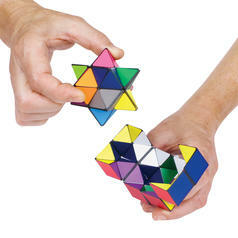 Fidgeting has never been more fun! Buttons can be pushed, joysticks and gears moved, switches flipped, etc. In every meeting, classroom or office, you can find at least one person fidgeting around, right? The frenzied clicking of pens ... the drum solos on table tops ... and the rhythmic rocking of limbs are all tell-tale signs of serial fidgeters. Although some studies suggest that fidgeting actually increases overall productivity (would you believe?! ), excessive fidgeting tends to distract those who prefer to work in silence. So what can we do to keep our hands busy? 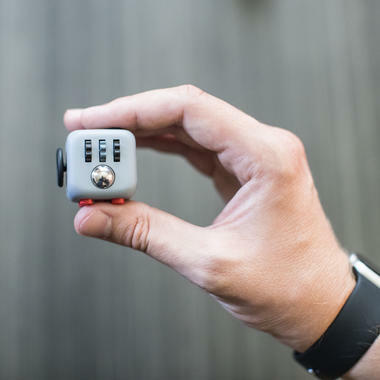 The answer is simple: get a Fidget Cube! The creative minds behind this vinyl desk toy have created a gadget that allows you to take your mind off stressful things while being (almost completely) silent! The six sides of the small cube feature various functions that will stop you from clicking pens and tapping tables forever. 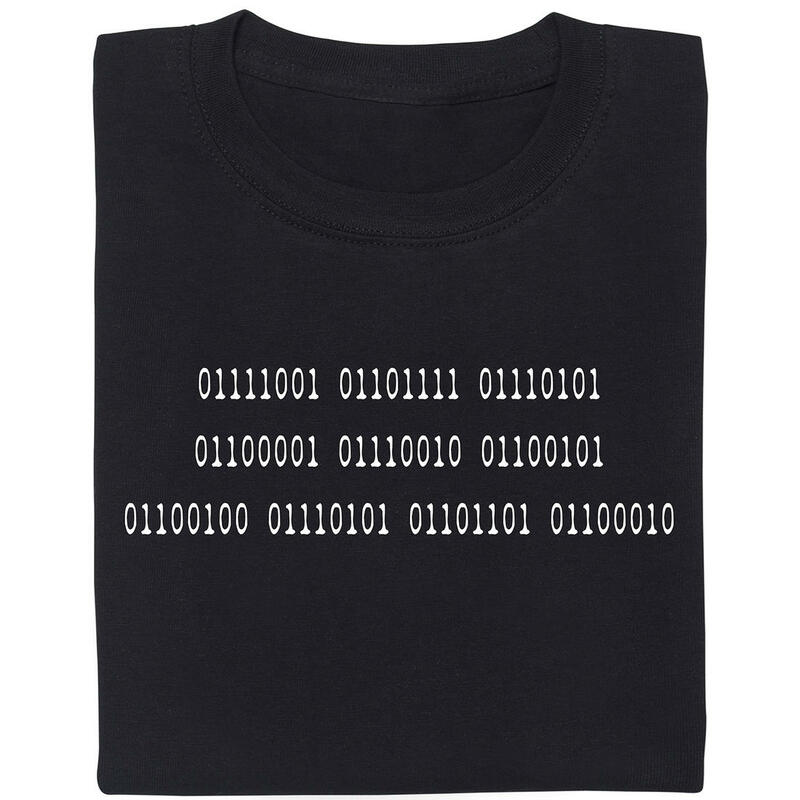 On side 1, you can find five buttons that let you press them till your heart's content. While three of them produce an audible clicking sound, the other two are silent for stealthy fidgeting in libraries, meetings or other quiet places. The joystick on side 2 is reminiscent of those on video-game controllers and enables you to think about your favourite games or draw shapes on the go. Side 3 features a switch that can either be flipped quickly for an audible click or flipped slowly for silent action. Side 4 is built like an old-school worry stone; rubbing it gently can help relieve stress and calm you down. Rolling is the name of the game on side 5. 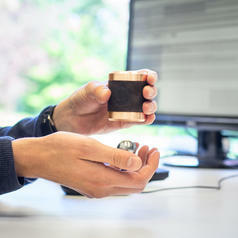 Three gears and a metal ball can be rolled around and the ball can also be pressed to produce the click you've been yearning for. Side 6 features a rotary dial that offers the same soothing action as old phones used to. Reduce your stress one turn at a time! The Fidget Cube is available in 6 randomly chosen colours. You can see pics of all the variants (orange, green, pink, blue, black and grey) at the top of this page (the model name is shown in the top left corner of each image). So get ready and fidget your stress away! Attentie: Niet geschikt voor kinderen onder de 36 maanden.